A clever heated sand box for chickens caught my attention recently. Build a box to hold one of those heated kennel pads and add about 5 inches of sand. Prop up an old window or panel of plastic to keep out snow and rain and you’ve got a nice warm spot for your flock to enjoy. Would an increase in Winter egg production offset the cost of electricity to run the pad? Image credit goes to Deb Bino from the Urban Chicken Podcast. I would think if you are trying to give the chickens a warm location to play in just setting up the window and insulating the other sides would help a lot. 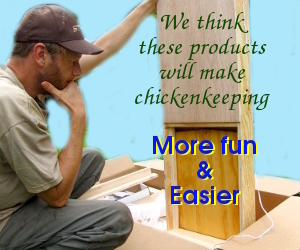 Think of your new cold frames but for chickens. They would get a nice solar heater where they could take their dust baths and a place to warm up. I did thin unintentionally this winter with a “shelter” between my coop and barn (for the chicken’s to run in). I used a cattle panel and put some tarps over 3/4 of it. Then some clear plastic over the last part. As a result the chickens had a sunny dry place that they used heavily. I saw many deep dust bathing locations in there. BW — Great idea! That sounds a lot better than an electric heating pad, and I’ll bet chickens would love it! We may have to do that for next winter. Any chance you have a photo you’d like to share of your setup? If so, please email it to anna@kitenet.net and we’ll put it on the blog so other readers can put on their own thinking caps.